This item has been added to your shopping cart 0 times. This will be taken into account when selecting the price scale. Customer evaluation for "Insole Foot Warmers"
The best insole/footwarmers I have ever tried! Wonderfull help to keep your toes warm. Very effective, comfortable and easy to use. we can recommend "The heat Comopany' to everyone! It is delicious, I never no more cold feet, I can not do without. My feet are warm now! I bought it in Bad Kleinchkerhim in the middle of december. IMaybe it was in Intersport?? And then I found yours... It was great !!!! When I returned to Slovenia, I had to ordered another 10 pairs. Immediatelly. For skiing, climbing... My feet are warm now...?? . All the time.. Priceless!!! Top product. Super service ! I use Insole FOot Warmers mostly for my winter outdoor photography, the heat lasts quite long. I have used them in hides for wildlife photography during very cold and at times snowy winter, during a photography trip to Lofoten, Norway in february where we were outside all day in quite cold conditions (Snow and wind). Very happy with them. They work best if shoe/boot is not too tight. I put the insole in the boot a few minutes before putting on the boots to let the insoles start heating, but not for too long otherwise it will be burning hot. Recommendable. great product , kept our feet warm the whole day at -25 degree. At first I thought I bought the wrong ones. I always used the foot warmers you stick to your socks. But these insole footwarmers are even better. I used them when the outside temperature was minus 17 and I had no cold feet at all!! Because you have more friction when the sole is not attached to your socks it works better!! You can also easily switch between your snowboots and skiboots and still have warm feet! So I am very happy with the insole footwarmers!! J'utilise ces semelles depuis plusieurs années pour la pratique du VTT pendant la saison d'hiver. Le produit est parfait et procure une chaleur confortable pendant au moins une demi journée passée à l'extérieur. C'est donc un élément incontournable pour rester actif pendant les saisons froides. Je ne peux plus m'en passer! This is the coldest weather we have had for several years, and this week the temperature is below freezing, night and day. So "thank you" to the Heat Company for providing a product which keeps my feet toasty warm for all my waking hours. Still good, but not as good as last year. I find that on very cold days, like now in the UK, I need a second one in the evening, unlike previous years. Although maybe it`s colder than usual, or maybe my circulation is worse! This is probably the fourth or fifth review that I have written for these excellent insole warmers. I buy them by the box and appreciate the 10% discount that I get for writing a review! The most recent ones I`ve had are slow to warm up [10 - 12 minutes] and last not a minute over the 8 hours stated on the cover. Some days I now have to use a 2nd one for the evening, so is getting expensive, so maybe I`ll have to put up with cold feet for part of the day. Very good service and product. High quality product, fast delivery, fair prices! I am thinking to start a little business based on heat products...Iceland is cold most of the year, and fisherman's wearing the rubber boots really need those products easy to use and very efficient! I have used two pair now, and I'm surprised about the effect of the footwarmers. When you have them in your shoes, you have no idea what they do, because you can't feel how cold your feet would have been without them. So II tried on the same conditions without the footwarmers, and what a difference!. And when I had them taken out after 6 hours, they were cold, but they started warming up again. I'm very happy with the footwarmers, and I'm very glad with the offer of one pair free with every pair I bought. Received my first order recently. The foot warmers heat up quickly and definitely warmed my feet. However I found them uncomfortably hot with normal weight socks. Next time I'll use heavier socks. A great invention! Very efficient and long lasting. Very efficient! When it is really cold outside, these will be a great help to keep your feet warm. They are so efficient that if you temporarily drive a car it is nearly inconvenient to have these in your shoes. On-off switch would be nice, but of course impossible to have here. When the reaction is started it goes to the end. Simply love them, easy to use, never disappionted. Good service, fast delivery and adequite communication. Lately in Holland it was snowing, and I tested the foot warmers on one of my bicycle night rides. The XL fit perfectly on my size 45. I was a bit worried how they would endure the pedalling but they were just fine, not to thick or weird feeling. The warmth was very comfortable. Back home I put them in a closed bag and indeed the reaction stopped, ready for later use. This short test was enough to make me confident for a long tour in the cold. Excellent! Super warm. I use them for biking and the Arne perfect. I use these foot warmers most days after damaging my feet and spinal cord. They stay warm most of the day and are very good value. These inner soles stay warm for hours! When I get back from my bike ride (feet no longer numb, as they used to be) I put them in my wellies while I wash the bike! Presume they’re meant for skiing but I thoroughly recommend them for cycling too. My daughter uses them when she goes to watch football matches too. A real life saver, a must have on a hike, in your car, in your camera bag! Have tried several makes and these are the best! These insoles last for longer than any others that I have tried. They also work out very reasonable when brought by the box! Easy to use. Nice feeling in the cold. I have tried several different makes of insole and these are the best fit, stay warm for longest and are the best value. Bought the insole warmer for use in photographing birds from some hides during winter. It was quite cold and thanks to those insole warmers plus some handwarmers the hourse of sitting quiet in the hides, sometimes at -5 degrees Celsius, it was by far more bearable than had I been without. Specially the insole warmers did a great job warming for 10 hours on the go, whilst the hand warmers I used to heat up the hands from time to time, or the cheeks, or the nose. Ican recommend this product. Also service is fast and reliable. Very satisfied. Taking more of this stuff on my coming photographic trip to northern Finland. I am a dressage judge and spend many hours sitting still judging horses, often in an unheated hut. However many layers you put on your feet always end up cold. 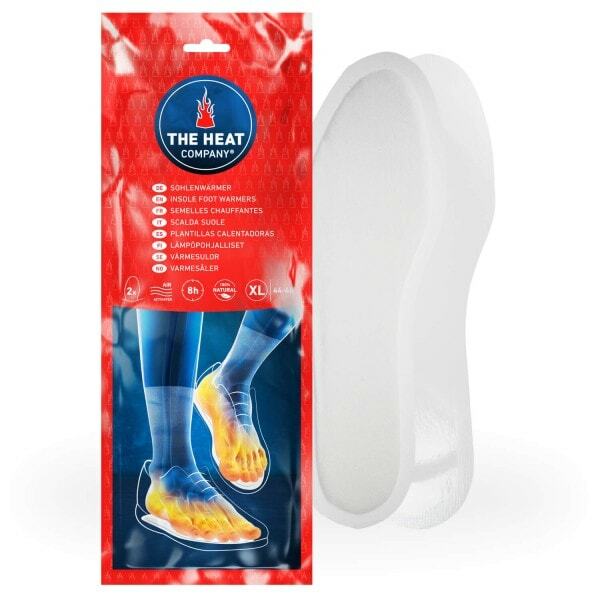 They are so much better than all other similar products I have tried as they heat the whole foot not just your toes as many products do. They are thinner than some products too so they are not bulky in your shoes. These heated insoles are lifesavers for me! I use them for cycling in winter and they stop my feet going numb! I would also wear them for watching football or rugby matches, when standing still results in freezing feet. Highly recommended for cold feet sufferers. Thanks to the Heat Company I now have warm feet all winter, and no more chilblains. Really pleased with the insoles, i suffer badly with cold feet & these kept them warm for hours while horse riding & working at the stables, would highly recommend! Thanks to the Heat Company chilblains are a thing of the past, and now my feet are toasty warm all day. And thank you that the price has stayed constant even although the GBP has sunk so low.